Understand which attributes are used by the application, by the process, and by both. Normally, you have attributes that are changed either by the application or the process, and other attributes that are changed by both. 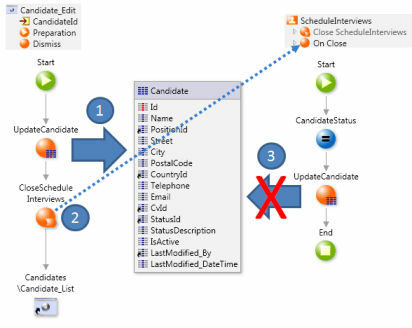 In the application flow, move the action that acts on the process life cycle as much as possible to the end of the flow. Add a CommitTransaction before it that will end the transaction and unlock the record. Beware that you are not allowed to roll back the transaction afterwards. The On Close call back action tries to update the Candidate record that is currently locked by the application. 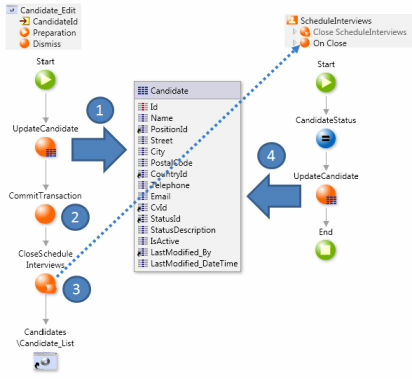 Let&apos;s identify which attributes are changed either by the application or by the process. The StatusId is only changed by the process. 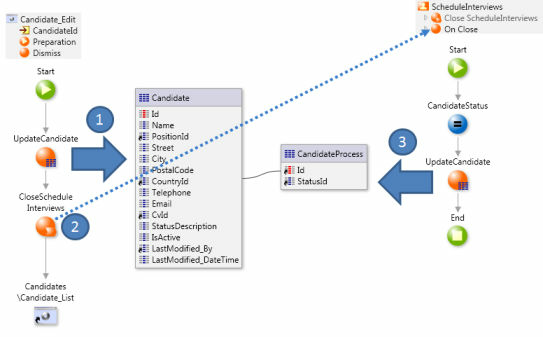 So, let&apos;s create the CandidateProcess entity to have it isolated there. The CloseScheduleInterviews is already at the end of the flow. So, let&apos;s add the a CommitTransaction before it to commit the changes in the database and end the lock.